The moral bottom line of the ‘Copenhagen Accord‘ promise is this: Rich countries must increase Climate Change Finance with new and additional money to developing countries from zero in 2009 to $100 billion by 2020. If this had happened gradually, then about $73 billion would have been delivered in 2017. ‘Oxfam‘ claims that the taxpayer-funded finance from rich countries to developing countries in 2015-16 was about $48 billion, or nearly half the amount promised for 2020. However, according to ‘Brookings‘ an earlier OECD-CPI report claims that as much as $62 billion was delivered back in 2014 – while India on the other hand claims that “only $2.2 billion could rigorously be defended as meeting the promise in Copenhagen” (COP15, 2009). Apparently, many flows counted by the OECD-CPI should not have been counted, flows such as “market-based loans counted at the full amounts, and export credits.” In other words, the confusion and dishonesty seem to be considerable. A more honorable source of knowledge appears to be ‘Climate Funds Update‘ – an independent website that provides information on “international climate finance initiatives designed to help developing countries address the challenges of climate change.” According to Climate Funds Update a total of $22 billion was financed in 2017 (accumulated since 2003, funding approved), of which about $16 billion were received by 150 countries (with amounts to specific countries). 138 out of the 150 recipient countries have full data in ClimatePositions and combined they received $14 billion (a minor fraction of climate finance to regions are not included). These 138 countries are examined below to reveal the variations of so called “developing countries” in the context of the ‘Paris Agreement‘. $7.2 billion of Climate Change Finance were received by 77 countries¹ without Climate Debt in ClimatePositions. Combined they received 51% of the Climate Change Finance (about $2.4 per capita received on average). $6.8 billion of Climate Change Finance were received by 61 countries² with Climate Debt in ClimatePositions. Combined they received 49% of the Climate Change Finance. Combined the 61 countries account for more than 32% of the current ‘Global Climate Debt‘. 25 of the 61 countries have per capita Climate Debts between $577 and $28,269 (Kuwait) and combined they received 23% of the Climate Change Finance of $14 billion. The 15 of 61 countries given the most Climate Change Finance received 42% of the Climate Change Finance of $14 billion (Brazil, Mexico, South Africa, Indonesia, Turkey, Ukraine, Egypt, China, Vietnam, Chile, Kazakhstan, Argentina, Russian, Thailand and Bolivia). 9 of the 15 countries have nearby or above World’s average GDP per capita (Kazakhstan, Turkey, Chile, Russia, Argentina, Mexico, Thailand, China and Brazil). 8 of the 15 countries have nearby or above World’s average Fossil CO2 Emissions per capita (Kazakhstan, Russia, China, South Africa, Ukraine, Turkey, Argentina and Chile). 5 of the 15 countries have had considerable Forest Cover loss; on average 12% loss since 1990 (Argentina, Bolivia, Brazil, Indonesia and Mexico). 7 of the 15 countries are both Climate Change Finance recipient countries and donor countries (Mexico, China, Brazil, South Africa, Russia, Turkey and Indonesia). 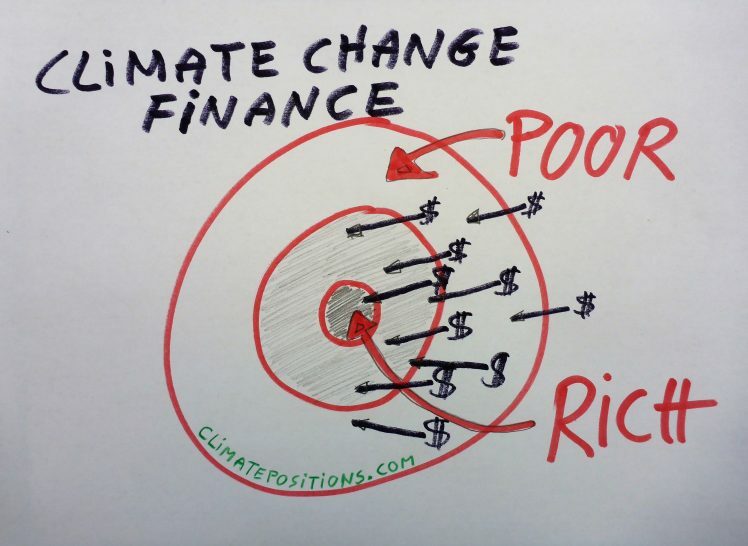 If “Climate Change Finance with new and additional money to developing countries” include recipient countries such as Kuwait, Trinidad and Tobago, Oman, Kazakhstan, Russia, China, etc., then poor developing countries without responsibility for the climate destruction will certainly be left behind. ¹77 recipient countries without Climate Debt, including five countries de facto without Climate Debt marked*: Afghanistan, Albania, Angola, Antigua and Barbuda, Armenia, Azerbaijan, Bangladesh, Benin, Bhutan, Burkina Faso, Burundi, Cambodia, Cameroon, Cape Verde*, Central African Republic, Chad, Colombia, Comoros, Congo (Brazzaville), Costa Rica, Cote d’Ivoire, Cuba, Dem. Rep. Congo, Djibouti*, El Salvador, Eritrea, Ethiopia, Fiji, Gambia, Georgia, Ghana, Guinea, Guinea-Bissau, Haiti, India, Kenya, Kiribati*, Kyrgyzstan, Laos, Liberia, Madagascar, Malawi, Mali, Mauritania, Moldova, Morocco, Mozambique, Myanmar, Namibia, Nepal, Nicaragua, Niger, Nigeria, Pakistan, Paraguay, Peru, Philippines, Rwanda, Samoa, Sao Tome and P., Senegal, Sierra Leone, Solomon Islands, Somalia*, Sri Lanka, Sudan, Swaziland, Tajikistan, Tanzania, Timor-Leste, Togo, Uganda, Uruguay, Vanuatu*, Yemen, Zambia and Zimbabwe. ²61 recipient countries with Climate Debt, including eight countries with de facto Climate Debt marked* (largest per capita Climate Debt first): Kuwait, Trinidad and Tobago, Oman, Kazakhstan, Malaysia, Russia, Bahamas, Turkmenistan, Iran, Equatorial Guinea, China, Slovakia, Venezuela, South Africa, Croatia, Bosnia and Herzegovina, Turkey, Barbados, Chile, Serbia, Argentina, Bulgaria, Belarus, Gabon, Mexico, Thailand, Suriname, Lebanon, Mongolia, Mauritius, Panama, Algeria, Macedonia, Guyana, Botswana, Brazil, Iraq, Romania, Ecuador, Jamaica, Indonesia, Dominican Republic, Egypt, Jordan, Ukraine, Tunisia, Uzbekistan, Honduras, Bolivia, Vietnam, Papua New Guinea, Tonga, Guatemala, Belize*, Dominica*, Grenada*, Maldives*, Seychelles*, St. Lucia*, St. Vincent & G.* and Syria*. Drawing by Claus Andersen, 2018.